The World of Ruin, Aeris, Blitzball. If you’re a fan of long running Japanese videogame franchise Final Fantasy, you’ll no doubt remember those three things as central elements of the series’ sixth, seventh and 10th games, without requiring further prodding. Such is the pull of Final Fantasy at its best – the less said about the likes of Final Fantasy XIII, the better – is that it creates die-hard fans and repeat players who know these games as a best friend, a member of the family. One of the main reasons for series’ emotional hook is its music. On November 22 and 23 at the Hong Kong Cultural Centre the Hong Kong Philharmonic is presenting orchestrated versions of music, largely composed by Nobuo Uematsu, from Final Fantasy VI, VII and X. 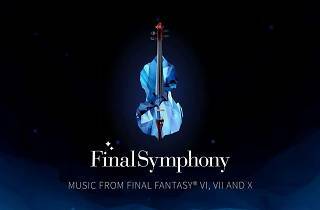 At Final Fantasy – Final Symphony, we guarantee that when the audience hears the first few notes of Terra’s Theme or The Great Warrior, there will be a room of fully grown men and women welling up. Surely that’s just as meaningful – in its own humble way – as how the revered works of Vivaldi, Bach or Wagner affect an audience. Hi guys. First of all, give us an overview of your backgrounds and how you came to be involved in the project. Chu: I’m the current chorus master of the Hong Kong Philharmonic. I was actually asked to do this concert last year when they were putting together this seasons’ programme because I have a lot of experience with video game music. A little bit of my background: I actually lived in Australia for quite a while working with video game studios there and helped to score a lot of the original soundtracks for games like Diablo and Soulcalibur. Fung: My background is as a composer. I did that for 10 years before I joined the Hong Kong Philharmonic as the director of creative planning. I only joined six months ago and this project was already in motion by the time I joined, so I kind of took over the planning side of things. But, of course, I did some research and actually changed things. Originally, we were going to feature a mixed programme of music from various different games [outside of Final Fantasy] but since it’s the 30th anniversary of Final Fantasy, I thought celebrating that anniversary would be stronger. Chu: In terms of Final Fantasy, I have actually done a few concerts featuring various pieces – sort of a ‘highlights’ kind of thing. This time, what we’re doing is actually something a little different. The previous concerts I’ve done, the pieces were performed as standalones – one track followed by another track. Now, we’ve rearranged them in symphonic form, in line with the format of a classical concert, where we can have a lot of different themes develop and then bridge them all together into a singular piece. Fung: As Philip says, this project is very interesting because we are not just playing the different little musical cues from the game, we’ve got some really amazing arrangers to put all these famous tunes and motifs together to form a symphony. It’s more classical in its essence. Chu: When you’re doing it piece by piece, there’s always a pause in between to break things up. But when you’re doing it like this, the difficult part is when the audience hears the first few notes of the tune, they know the whole background – the associated visuals in the game and what it represents. Sometimes, though, the arrangement may not be exactly the same – despite inducing a feeling of reminiscence – because of the different instruments and arrangements. The most difficult part for this concert is actually capturing the essence and the spirit but with a different sound, convincing the audience that they can acknowledge or appreciate the pieces from different angles. Do you think a concert like this helps bridge the gap between popular culture and the culture of classical music? Chu: Absolutely! The concept – and I’m being very general here – of a symphony orchestra, playing Mozart and Beethoven, might be off-putting for the general public. I think there is still a good portion of the public that has never heard a live orchestra. I think this is a very good channel to bring them to a concert and hear how the live music is made. Fung: I agree. The motifs and melodies are already familiar to the audience, so I think it’s a really great way to bring in people that may not otherwise come to an orchestral concert. Stepping into the Cultural Centre Concert Hall, to come here and listen to an orchestra in this kind of setting will be a first-time experience for many, I think. How would you rate Final Fantasy’s music, on a purely objective level, bearing in mind the kinds of music you usually work with? Chu: I need to think about how to answer that! In terms of the music material, the structure and concept, the music is all very good. But, perhaps, it’s lacking on the technical side. What they do works on a computer but they don’t always understand the boundaries of an instrument, so those kinds of compositions suffer a little when orchestrated. For example, this kind of music, the brass is very heavy and I’ll be telling the brass to play louder. I’ll say, ‘that’s not enough!’. They will be looking at me very weirdly because it’s so rare for conductors to tell the brass to play louder and not to shut them up! That comes with another headache for, say, the woodwind section in front. I need to overcome this traditional mentality during rehearsals before we can actually deliver a good product to the audience. Fung: They are very good arrangements. They really work with the material and are well integrated in to a larger structure symphonically. Some people say that movie and game soundtracks are the classical music of the modern age. In some ways, maybe. I don’t know. But video game music is such a large market now. It touches a lot of people and reaches out to such a big community. Final Fantasy’s identity is quite firmly established through music, the melodies are easily recognisable. In that sense, surely the music is very strong because people recognise and identify with the games simply by listening to the music. We have already test run some of the pieces we are going to do, we have played these to gamers and the reception has been very good.